It’s the distant future, and mankind has taken a galactic leap forward through space, time, and technology. Life as we know it struggles to endure on the Abaddon. Once the home of a mysterious, non-human civilization, the planet is now a desolate wasteland bearing one immensely precious resource: Feronium power crystals. The unimaginable energy contained within the crystals is coveted by two groups of humans: the Satellite City-States and the Commonwealth Alliance. Using Links – giant bio-mech suits made from modified military vehicles and alien technology – the warring factions fight a weary battle for territorial control of the Abaddon. At your disposal in Abaddon is a 28″ x 19″ battlefield game board with 32 highly-detailed mech figurines, 18 free-standing landscape terrain features, over 100 game-changing Wild Fire and Weapon System cards, dozens of tokens, battle dice and a Battle Manual containing over 15 mission scenarios. Choose your allegiance and lead your army in non-stop excitement as you forge through unforgiving terrain, fight to overcome random and bizarre technological glitches, and battle your enemies in never-ending war. 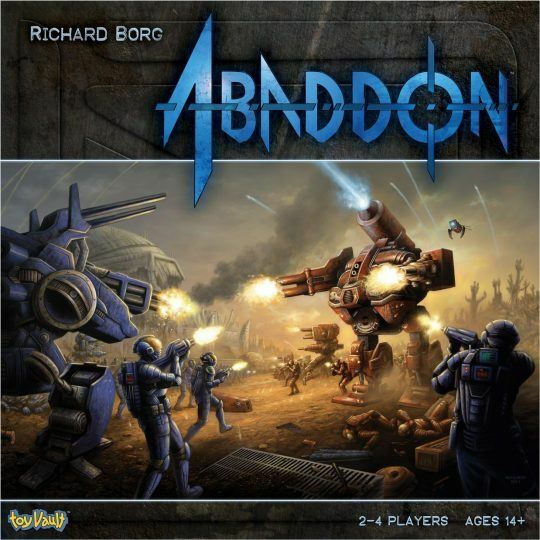 Abaddon is a furious, two-to-four-player game of futuristic combat. Each scenario is laid out on the customizable battlefield game board with each side using a varying number of units. The game is played in turns during which a player rolls his Activation Dice, allowing him to “activate” certain units and move them. These mechanical units – Links – are powered by Feronium power crystals, and as they take damage these crystals are depleted. A unit that runs out of crystals is unable to continue functioning and is considered destroyed. Victory is determined based on stipulations presented by the chosen mission scenarios. Typically, victory is achieved by damaging and destroying your opponent’s units by way of their power crystals. Each destroyed enemy crystal is worth one victory point, which players must collect in order to win.